An elegant way to stretch your meat budget in these austere times is to make Swedish or Scandinavian-style meatballs. Each household cook has his or her recipe, but the basics are ground meat such as beef, veal and/or pork mixed with bread crumbs or bits of bread (I use bits of brioche pulled out from my brioche hamburger buns, which have been reserved in a freezer-bag), an egg and some cream or milk. Finely-minced onion is optional. Spices include nutmeg and/or allspice, salt and optional white pepper. Onion powder can take the place of minced onion, or that flavour may be omitted altogether. Meat mixtures are shaped into small balls and rolled in flour, then fried in butter. A pan-gravy is made while the finished meatballs rest in a warm oven until serving time. I prefer to use ground beef, brioche bits, sour cream, minced onions or onion-powder, nutmeg, salt and white or green ground pepper. 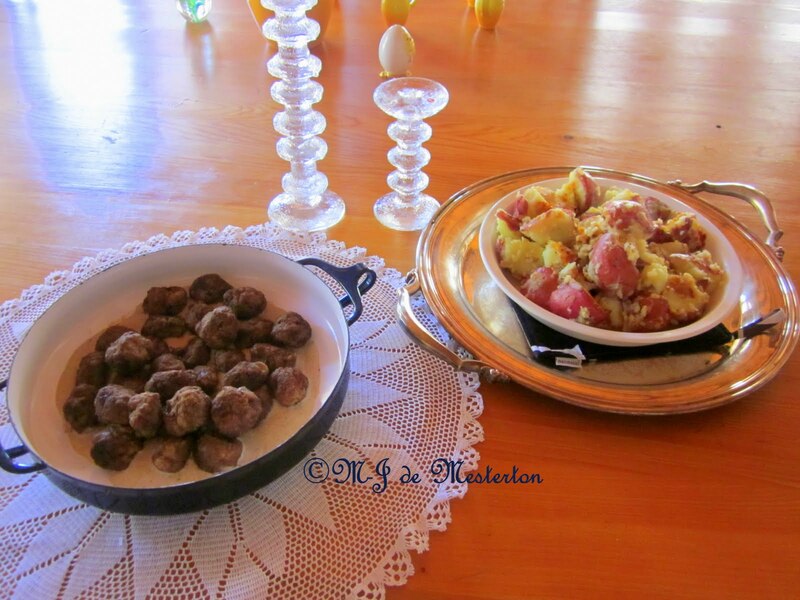 Serve Swedish meatballs with new potatoes and perhaps a little lingonberry or cranberry sauce on the side. 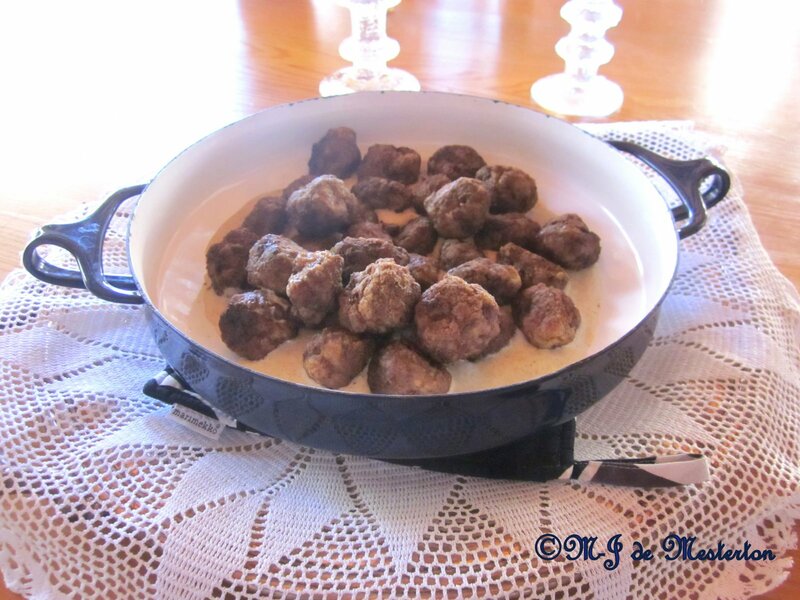 This Danish baking-dish has the traditional cream gravy at its bottom, topped with the meatballs (this type of meatball recipe is found in Swedish, Danish and Finnish cookbooks). Very small new potatoes are usually just boiled in salted water, and not cut into pieces. These Yukon Gold new potatoes have been cut and boiled, then sautéed in butter and smashed lightly.